Donald Davis is in such demand as a performer and teacher that librarians, teachers, and other storytellers literally wait years to book him on their schedules. Now he offers his workshop on story creation in handbook form for those who can't wait to hear him. Telling Your Own Stories is designed for families, teachers, counselors-anyone who wants to inspire storytelling either in themselves or in others. Through a series of memory prompts, the user is led through the creation of plots, of place, and of characters. Whether the goal is fiction or family history, whether the medium is oral performance or written story-the exercises in this book will guide the aspiring storyteller through a series of confidence-building steps. Features include a family lifespan chart, a story-form format, suggestions for memory recovery, and more than 50 "crisis prompts" to break through writer's-or teller's-block. If you've ever thought that you had no stories to tell, or suspected you did but didn't know how to get started, this book is for you. 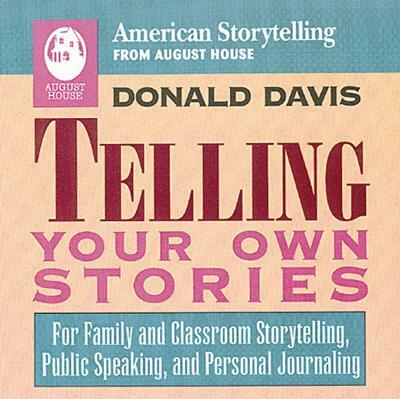 DONALD DAVIS grew up in a family of traditional storytellers in North Carolina. After twenty years' service as a United Methodist minister, Davis became a full-time storyteller, now giving more than three hundred performances each year. Book Details: paperback, August House, Inc.